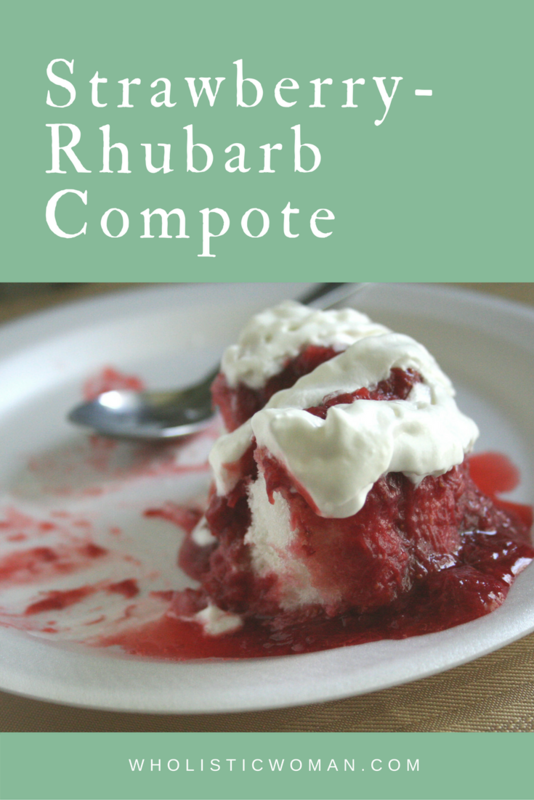 This week’s Sunday Supper theme is Mother’s Day Meal Ideas so I decided to share a recipe that reminds me of my mom–Strawberry-Rhubarb Compote. A few years ago I made this to bring to my mother-in-law’s and it continues to be one of my favorite recipes. I remember that at the time I felt a bit guilty that rather than grow it myself or pick it up from the farmer’s market, I bought the rhubarb at the grocery store–along with some store bought whipped cream and angel food mini bundt cakes. I said yes, yes it is in fact rhubarb. “My grandma used to make rhubarb jam in the spring,” she said. “Her neighbor grew it. It was so good!” She smiled as she remembered, and I smiled back. I felt a little less guilty about buying rhubarb from the store. What is it about certain foods that bring us back in time? I remember chewing stalks at my own grandmother’s after church on Sundays. She would also make rhubarb sauce that was sooo good–just rhubarb and sugar. Although my grandmothers and DH’s grandmothers have long passed, recipes like this help us remember simpler times. Toss together the rhubarb and strawberries in a saucepan; simmer over medium-low heat for 15-20 minutes or until the strawberries and rhubarb break down and form a sauce. I covered the pot at the beginning, then after the strawberries seemed thawed I removed the cover. Not sure if that did anything or not, it just felt right. Stir in 1/4 cup of brown sugar; taste; add more if needed. Will vary depending on the sweetness of the strawberries and the tartness of the rhubarb. 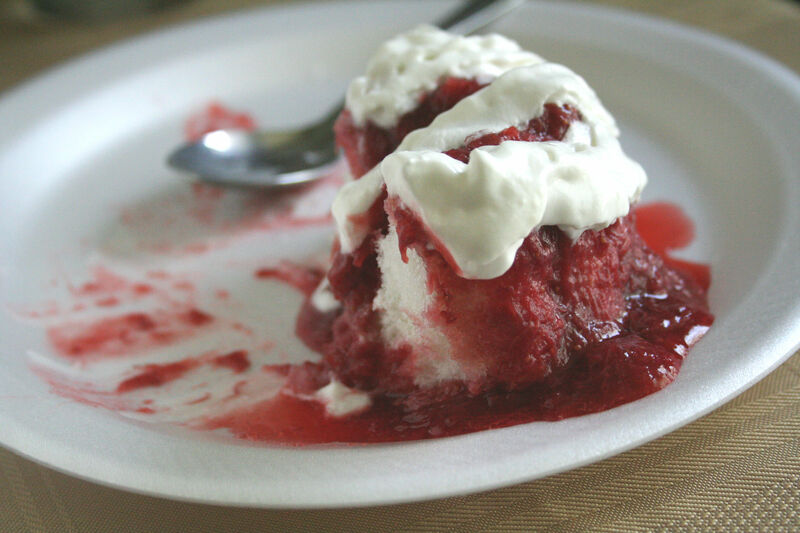 Let cool a bit and serve over ice cream or pound cake or angel food cake, topped with whipped cream. The Verdict: Everyone loved this, and I think it was the least amount of sugar I’ve ever used in a rhubarb dish; possibly because I froze the berries at their peak of ripeness last year–they were incredibly sweet. I’d never eaten rhubarb before I had to make a few recipes for an article 3 years ago. My mom never ate it (despite our neighbors’ standing offer to share from their huge patch of it), so I never did, either; I recently asked her why she never ate it. She said she didn’t because her mother never did! So glad I “had” to work with it, because you’re right that compote or sauce – with or without strawberries – is awesome. I wanted to share another way to use it. When I made it, my friend at the magazine sampled it after the photo shoot and I gave her some to take home. She reported that it was a great addition to her homemade yogurt. I love strawberries and rhubarb together! What I find funny is that most people who haven’t had rhubarb automatically assume it’s gross. I’ve converted many over to the deliciousness of rhubarb. This would be perfect over Angel cake or plain yogurt! Delicious!